In a comprehensive and lucid manner this book presents an understanding of the aging degradation of the major pressurized and boiling water reactor structures and components. The design and fabrication of each structure or component is briefly described followed by information on the associated stressors. Interactions between the design, materials, and various stressors that cause aging degradation are reviewed. In many cases, aging degradation problems have occurred, and the plant experience to date is analysed. The discussions summarize the available aging-related information and are supported with extensive references, including references to U.S. Nuclear Regulatory Commission (USNRC) documents, Electric Power Research Institute reports, U.S. and international conference proceedings and other publications. 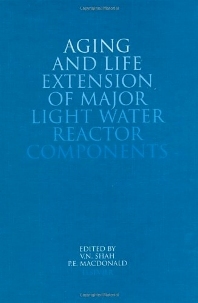 The book will prove a useful reference for engineers engaged in the operation and life extension of the present generation of nuclear power plants and for those engaged in the design of advanced light water reactors. It will also provide engineering students with insight into the practical materials-related issues associated with the design and operation of nuclear power plants. The work will also serve as a basis for programs to address the new aging-related issues likely to arise as plants get older. (Selected) Pressurized Water Reactor Pressure Vessels. Design materials. Stressors. Degradation sites. Degradation mechanisms - radiation embrittlement - fatigue. Potential failure modes. Mitigation of embrittlement damage - reduction of thermal stresses - flux reductions - thermal annealing. Inservice inspection, surveillance and repair - inservice inspection methods - flaw distribution measurements - surveillance programs - estimating the mechanical properties of irradiated materials - weld repair. Summary, conclusions and recommendations. Pressurized Water Reactor Coolant Piping. Design and materials - geometry - materials and fabrication. Stressors; - steady-state stress - transient stresses. Degradation sites. Degradation mechanisms - fatigue - thermal embrittlement - stress corrosion cracking - corrosion - erosion and cavitation - creep. Potential failure modes. Inservice inspections - inservice inspection requirements - material considerations - inservice inspection reliability. Summary, conclusions and recommendations. Counter Measures For Tube Failures In Pressurized Water Reactor Steam Generators. Steam generator tube degradation - recirculating type steam generators - once-through steam generators. Mitigation techniques - secondary-side chemical impurity control - chemical additives that inhibit corrosion - steam generator secondary-side cleaning - shot peening and rotopeening the tubing - stress relieving the U-bends - reducing the hot-leg-side temperature repair - flaw-acceptance criteria for tube integrity - plugging - sleeving - nickel plating. Replacement of steam generators. Summary, conclusions and recommendations. Boiling Water Reactor Pressure Vessels. Design and materials. Stressors. Degradation sites. Degradation mechanisms - fatigue - intergranular stress corrosion cracking - radiation embrittlement - stress corrosion cracking. Potential failure modes. Inservice inspection, surveillance, monitoring, and repair - inservice inspection - surveillance - on-line monitoring - field repair. Summary, conclusions, and recommendations. Boiling Water Reactor Vessel Internals. Design and materials - incore instrument housings - core shroud and core plate - Shroud baffle plate - fuel supports - jet pump assemblies - top guide - core spray lines and spargers - shroud head - feedwater spargers - steam separator and dryer assemblies - materials. Stressors. Degradation sites. Degradation mechanisms - intergranular stress corrosion cracking (IGSCC) - irradiation-assisted stress corrosion cracking (IASCC) - fatigue - thermal embrittlement - radiation embrittlement. Potential failure modes. Inservice inspection, monitoring, and repair. Summary, conclusions, and recommendations.